Researchers at the University of Washington (Katie Davis, Ligaya Scaff, Milly Romeijn-Stout) and the University of Maryland (Mega Subramaniam, Kelly Hoffman) are delighted to announce the launch of the ConnectedLib Toolkit, a research-based professional development toolkit that sup­ports librar­y staff in their efforts to lever­age new media tech­nolo­gies and pro­mote youth’s con­nected learn­ing expe­ri­ences in libraries. The development of the toolkit was made possible by generous support from the Institute of Museum and Library Services (IMLS). The toolkit, which is hosted on GitHub, offers youth-serving library professionals and professionals-in-training a set of free, customizable, and self-paced modules that will help them plan, develop, and assess innovative and engaging programs for their teen patrons. In developing the toolkit, our primary objective was to create a set of resources that could be readily tailored to the wide variety of settings in which youth library programs are developed and offered. 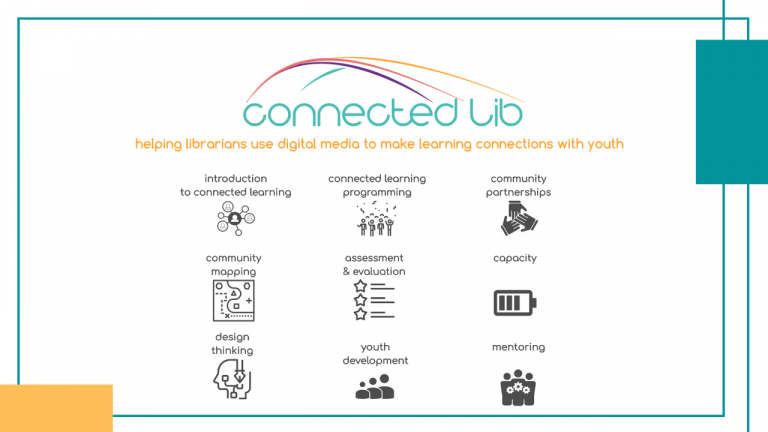 Based on the principles of connected learning, the ConnectedLib Toolkit begins with a module introducing the connected learning framework and its relevance to youth library programming. Right away, users are encouraged to tie the ideas presented in this introductory module to their specific context by creating a simple plan to implement or enhance connected learning in their library’s youth services. They are then invited to make modifications to this document as they work through additional modules in the toolkit. This interactive, customizable approach is carried throughout the remaining eight modules. For instance, in the Community Mapping module, users engage in a series of exercises in which they collect information about the youth, organizations, and resources in their community. They are then shown how to turn this information into a community asset map, which they will use as a basis to identify and plan youth programs that engage the unique mix of expertise and resources in their community. In addition to the Introduction and Community Mapping modules, the ConnectedLib Toolkit also contains the following topics as standalone modules: Connected Learning Programming, Community Partnerships, Capacity, Design Thinking, Mentoring, Youth Development, and Assessment & Evaluation. Why these particular topics? Before embarking on the development of the toolkit, our team spent over a year interviewing 88 youth-serving library professionals in 41 states and the District of Columbia, asking them to reflect on their current youth programming, their use of digital media technologies, and notable successes and challenges that they have experienced. We distilled the major themes from these rich conversations, and shared them with our three library partners in this work—Providence Public Library, Kitsap Regional Library, and Seattle Public Library—who helped us to identify the nine major topics that should be highlighted in the toolkit. We then engaged our partners further in a series of participatory design sessions over the course of several months in which they helped us to ideate and iterate on our initial module outlines. Their input proved invaluable, as they ensured that the content and layout of each module would be relevant and engaging for a variety of busy youth-serving library professionals and professionals-in-training. As a result, we feel confident that we’ve hit on an optimal combination of text-based information, videos, case studies, interactive exercises, and “further reading” resources. 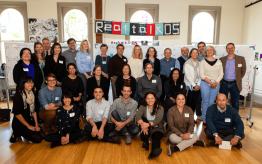 The research that went into the toolkit development underscored the absolute necessity of creating a set of resources that can be easily adapted to a variety of library contexts, from large, urban library systems to small, rural libraries, and everything in between. So, although we are proud of all nine modules in the toolkit and believe that each one is worth completing in full (we provide an estimate of how long each module is likely to take at the top of every module homepage), we deliberately designed the toolkit to be used flexibly, to meet the specific needs and goals of individual users. If you already have deep knowledge of design thinking, for instance, you may want to skim through that module and work on select topics, or (gulp!) skip it altogether. Already an expert on youth development? Then perhaps you’ll want to focus your toolkit experience instead on community mapping and building capacity in your library. 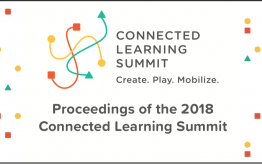 Whatever knowledge of connected learning and related concepts that you bring, the toolkit is ready to help further your thinking and support you in your efforts to create rich connected learning experiences for your youth patrons. The ConnectedLib Toolkit is available for free here: https://connectedlib.github.io/.